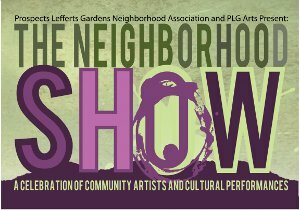 Prospect Lefferts Gardens Neighborhood Association (PLGNA) and PLG Arts present THE NEIGHBORHOOD SHOW THURSDAY, OCT. 13 through OCTOBER 24, 2011 at 552 Flatbush Avenue, between Lincoln Road and Maple Street in Brooklyn (the old Mike’s International Restaurant location). Featuring the works of dozens of neighborhood artists! Live music and crafters on the weekends! Come celebrate the vibrant art of Prospect Lefferts Gardens!